We had a lot of fun planning treats for our Miniswap partners - two little girls - such fun! T-shirts (thrifted) dressed up with some appliqué. 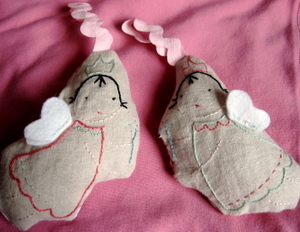 Little embroidered fairy dolls on linen. The design was just a little doodle that I did. Princess helped with some of the stitching. The backs of these are two pink cotton prints. I'm especially fond of the wool felt wings. 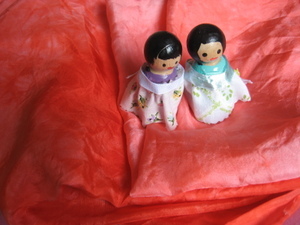 Hand-dyed playsilks and peg dolls. Princess helped with the dolls, too. One morning I got all three kiddos stringing beads. It was one of those awesome moments where everyone is happy, quiet, and doing a project. I love those (fleeting) times. 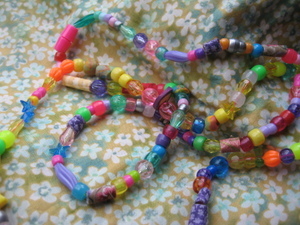 If you look closely at the beads you might notice a couple of clay ones and a few fabric ones that Princess and her friend made one day. 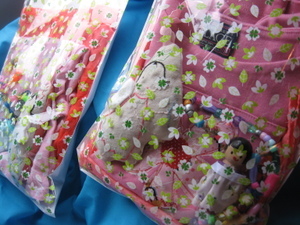 I packaged each girl's gifts separately - and there were a couple more goodies included in the package as well. The Miniswap is such fun - and such a great idea. It would be fun to do a little miniswap of your own with cousins or friends that live far away. 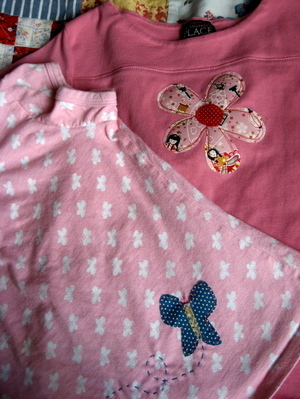 And the Miniswap flickr pool is a great place to get ideas for handmade gifts for kids. (And here's what I sent and received last year).